The "About" page on your website is the second most visited page on your website, after the home page. People arrive on your home page, and they click over to "About" to find out who you are. It's therefore super important that your "About" page packs a punch. It's a brilliant opportunity to get your message across and present your "unique selling point" to your website visitors. So often I see this opportunity under-used. This could be because people feel shy about talking about themselves. It's time to get over it! You're almost 100% sure that your visitors' eyeballs will be on that page, so make the most of it. Your "About" page must be anything but dull. It must sizzle! How can you create a really lively and effective "About" page? Yes, the "About" page is about you. BUT what the visitor cares about is themselves. Talk about what they're interested in and how you are uniquely positioned to help them and you'll strike a chord. Add a human touch. Use humour as appropriate, in a way that suits you. 4. Avoid jargon and sound like a person. This is a better way of inspiring trust and credibility than sounding stiff and formal. You want to sound approachable, not offputting - you can be business-like without being dry. ...instead of industry buzzwords and meaningless clichés (such as words like "outstanding,""visionary," "second to none," "cutting edge"); these will have more impact on your visitors and avoid looking boastful. This means it's not only you who is "speaking," but other people's voices are also heard: the words of people who rave about you or your products or services. A great way of saying how wonderful you are without having to blow your own trumpet! This is a good place to ask your visitor to connected with you. People are more likely to sign up to your mailing list when they're feeling connected with you. These must be good. Depending on what you're doing, these can subtly portray a lifestyle the visitor may identify with, or want to be part of. These are individual-looking alternatives to photos, or additions - these can really add personality to a website. If possible! This is a way of making what you do come to life for the visitor. Don't make it dense. Use bullets, Q&A or short videos to make the information easily digestible. Here are some wonderful examples of "About" pages. Do click on them to visit the live sites as you can't see much from the screenshots. Humaan's site is a quirky, fun, highly creative site (no wonder, they're a creative agency). You may not have the tech wherewithall to create moving images like theirs (scroll down on the page), but the photos of the staff and the witty texts about them are inspiring; a similarly fun approach is achievable by anyone - if, of course, it rings true for you. I also really like the part on the page where they say what they will and won't do (scroll down more) - this conveys some serious messages (they won't work for free or at the weekend, they aim to exceed expectations and are highly creative) hidden within the humour. Matcha Kari is a company selling Japanese matcha online to Americans. Their "About" page does a brilliant job of conveying to a relatively uneducated audience (although matcha is quite a serious trend) the importance of the tradition behind the drink, as well as establishing the need for quality. So, it's basically an educational page that persuades the potential buyer that this is a product worth spending money on. The understated yet beautifully styled photos also do a very good job in subtly conveying the idea that this is a lifestyle choice. Artefact Uprising is a company that really cares about their products, their customers and the environment. They tell you their story, but they also invite you to tell yours by uploading your own photographs of their products. You may think this is a nice marketing tactic (and it is), but since their products are prints of their customers' own photographs, it seems like a personal gesture, as though you are part of a club. If you look at their "About" page, and the pages that lead off from it, you can see that everything goes towards an overall impression of their sincerity, that they are a company you'd like to do business with. 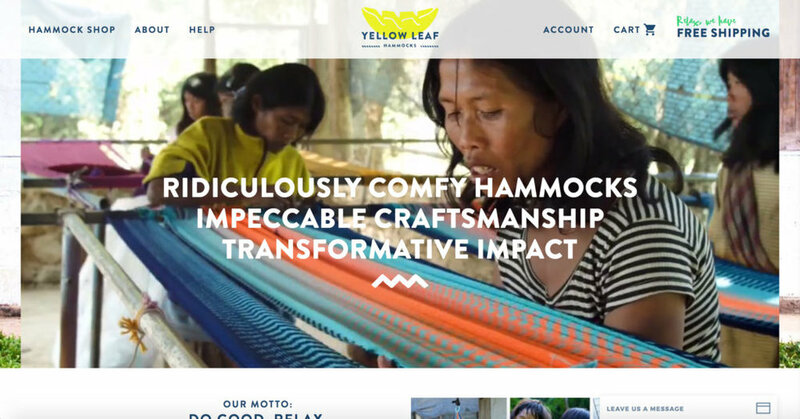 Yellow Leaf Hammocks is a company dedicated to sustainable social change... which is enough of a reason to make people want to participate in their project by buying a hammock... but they also manage to convey an idea of fun and adventure in their about page, with their bright colours, pictures of smiling people and their proudly displayed motto: "Do Good. Relax." This site, for an artisan ice-cream company (Coneflower) is just lovely! The photos are quirky and the illustrations really pretty and original, but it's the writing that does it for me: pure poetry designed to make the visitor's mouth water just thinking about their "farm-fresh" ice cream. With Hello Alfred, a modern-day errand-running concierge/butler service, we can see some nice photographs that suggest a desirably calm, unstressed and organised lifestyle. What I want to point out to you here is the nicely-done icons (you'll have to click on the image and scroll down to see them); they've chosen three main "benefits" to the customer of their service, and then made them stand out by arranging them in a row with a specially-created icon for each. A clever way of bringing them to our attention! Have you got some ideas? Anything you can take away from here to adapt and use on your own website? I'm always talking about standing out in a crowded world - your "About" page is your best chance to do it.